This short legged rugged little dog has small cat-like feet and a harsh waterproof coat. Australian Terriers are one of the smallest in the Terrier Group but are extremely brave for their size. Australian Terriers come in solid red, sand-colored with tan markings or silvery blue with tan markings. Australian Terriers shed little to no hair and should be brushed regularly to distribute the natural oils in their coats. This breed is non-shedding. 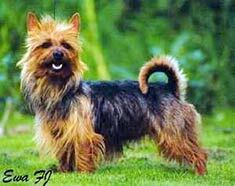 Fiesty and alert the Australian Terrier was originally an aid to the pioneers in the harsh Australian outback. Australian Terriers are endearing and loving and make excellent companions. Australian Terriers are tough and cheeky little dogs, despite their size and will even go after snakes. 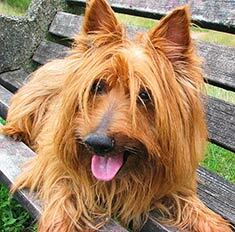 The Australian Terrier is a healthy breed that generally lives for a long time. The life span of the Australian Terrier is about 15 or more years. Suited for city or country life, Australian Terriers are active indoors and can get enough exercise living in an apartment provided this is complimented with walks. They should not be allowed to roam free in open spaces or they will chase things. Find Australian Terrier Puppies with our Free Breeder search!